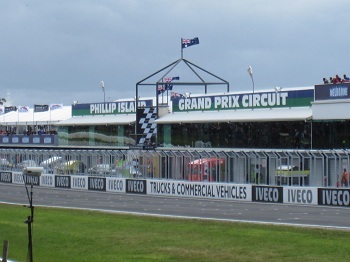 It’s hard not to be excited every time you catch sight of the entry to the Phillip Island Grand Prix Circuit - clearly Australia’s best, and rated by many internationals as their favourite. And so we found ourselves in a queue of a couple of hundred cars, vans and trailers on a sunny Thursday morning, outside the gates of one of the worlds best race circuits among our fellow competitors, nervously milling around waiting to get in. This being Drmsby’s first time at the hallowed Grand Prix circuit - his first trip to Victoria in fact - we had taken advantage of the practice day arranged for the Thursday preceding the event. The pit was set up and refined, cobwebs blown out of bike, rider and crew and Drmsby set to work understanding the circuit and the way the bike handled it. Fortunately the notoriously fickle Phillip Island weather was kind and we were blessed with a warm and sunny day, with a fresh tailwind on the straight in the morning and pushing into a stiff headwind by the afternoon. Happily the bike performed well and there were no real issues to deal with other than experimentations with gearing, allowing Drmsby to concentrate on the track, and how to master it. Based on previous years we knew that times in the low 1:50’s would put us amongst the front runners, and if we could get into the 1:48’s we’d be in a strong position when racing commenced on Saturday afternoon. Drmsby showed why he earned the #1 plate that we proudly carried as National Champions, ending his very first session in the 1:58’s and working his way down to the 1:52’s by the end of the 4th session at the end of the day. We retired into the Island’s charming main town of Cowes for an evening meal, meeting up with fellow Laverdisto Pat and enjoying a meal and some tall stories. 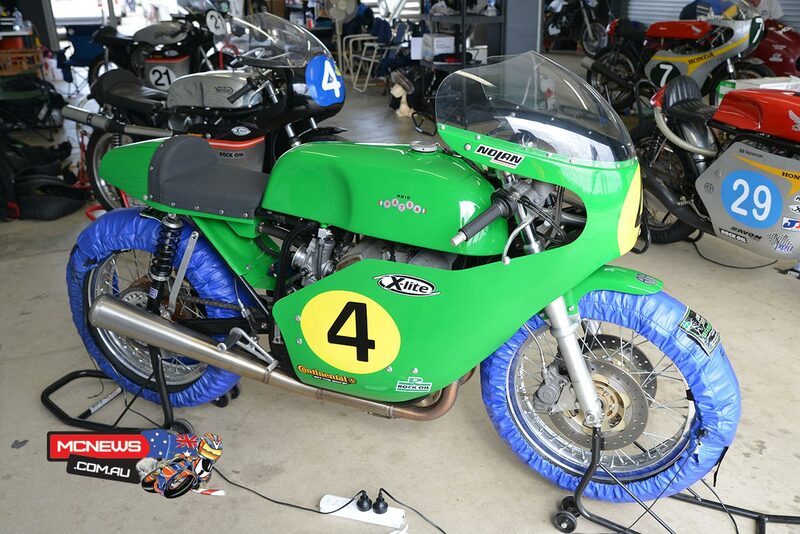 Our races would be combined 500cc and Unlimited Post-Classic, meaning we’d be sharing the track not only with the fast CB750-based Hondas, but also ex-Grand Prix 500’s up to 1972. The best of these was a jewel-like Paton BL3, ridden by Dave Johnson - an international rider who for some years has been competing throughout the UK and Europe, in 2012 riding BSB Superstock 1000, achieving race wins and podiums! The Paton he was riding was superbly prepared, owned by Australian racing royalty Ron Angel, and dripping with the most exotic componentry available. We had to pinch ourselves that we were even on the same track as such a combination, let alone that we had the very real intention to challenge them! Although wanting to go for outright wins, it was the Unlimited class runners we actually had to beat. The front end of Unlimited was all stacked with Hondas, Ron Young not having repaired his Ducati since the Nationals, and Sam Muldoon not having entered on his Yamaha. The Honda runners included Rex Wolfenden and Dean Oughtred, who we had raced against previously, and also Simon Cook and Robert Wallace from South Australia who we knew from previous results could run a strong pace. Friday morning dawned cloudy and warm, the day having it’s top temp of 26 around 9am and getting cooler all day but thankfully staying dry when we were on track. We made the second revision to our gearing after a slightly lacklustre first practice session, still ending up 2nd outright but only posting a 1:53.6. With gearing finding the sweet spot at last, 2nd practice went well, claiming the fastest time with a 1:51.0, from Craig Ditchburn on a Seeley-TZ 500 and Dave Johnson on the Paton. The afternoon saw us run the first Qualifying session, once again topping the time sheets with a 1:50.6, Drmsby really starting to find his preferred lines and gear change points. We retired for the day pinching ourselves to be leading this early after arriving with no real experience of the place at all, but knowing that our competition was vastly experienced and would surely get faster. We’d have to crank it up on Saturday if we wanted to challenge for wins. It rained quite heavily overnight and heavy clouds hung over the circuit as we arrived, but the rain held off and the typically stiff Phillip Island breeze saw the track all but dry by the commencement of activities at 9am. Happily the weather continued to improve throughout the day, and although it was quite cool the sun made an appearance by midday and that was the last time we had to worry about the weather. Our first session was fairly late on Saturday morning, allowing Craig and I to have a bit of a sleep-in and to leave the primary chain change till the morning when the bike was nice and cool. Along with my addition of a rear cush drive, Andychain’s awesome IWIS duplex primaries have ended the run of primary drive failures the old 915SFC Replica had earlier in it’s competition life. The chain we used on Thursday was also used throughout the 3 days of the Nationals and showed no adverse effects, but caution dictated a fresh one for the three remaining days of the Island meeting, the change performed without fuss and the bike back on it’s stands with tyre warmers on by 9am. Qualifying 2 was run mid morning and saw Drmsby really get cracking. His 1:49.06 was enough to secure pole position by some 1.6 seconds in a field of truly impressive bikes and riders. That he did it on his first visit to the track made the feat all the more impressive, and Drmsby now has a pole position run stretching back over 4 years - quite amazing! With gearing dialled in and the engine running well, we had started to make some fine adjustments to the suspension settings, trying to dial out some chatter that had entered now he was really pushing the pace through the fast corners of Stoner Corner (turn 4) and Turn 12. Second on the grid was Dave Johnson on the Paton, followed by Simon Cook, Dean Oughtred, Robert Wallace and Rex Wolfenden - all on Hondas. Although we had a seemingly comfortable buffer, we knew that the competition would close the gap, and that the front half dozen were all capable of sub-1:50 laps. Drmsby launched well but was swamped by the big Hondas and lightweight Paton on the run down toward Turn1, running fifth behind Cook, Wolfenden, Wallace and Johnson. Drmsby followed Johnson around the outside of Wallace in Turn1, Johnson also slipping by Rex before Southern Loop, leaving Drmsby to run a high line around the Loop, taking him right around the outside of Rex, the two of them battling it out through the super-fast Stoner corner before Drmsby finalised the passing maneuvre into the tight right hand Honda corner. At the same time, Simon Cook took to the exit road - his engine expired - leaving Johnson and Drmsby out front. What would ensue was three and a half of the most exciting laps of the whole meeting, as the two of them battled it out for the lead, never more than a couple of bike lengths apart. Converse to what may be assumed, the little 500cc twin cylinder 4-stroke Paton had a very slight straight line speed advantage, while the comparatively big Laverda was better through the corners. Drmsby was pushing to the limit but whenever he had a bit of momentum there was no track space to make a pass, and he had to back off. On the third time down the straight Drmsby had set it up to be on the inside exiting turn 12, the two of them flat out down the straight, dead level only a foot apart, Johnson reaching out and tapping Drmsby on the arm, looking at him and gesticulating as if to say “come on, what else have you got?” - a superb moment. Drmsby did actually lead over the line on that lap, by just a few thousandths. Throughout the last lap Drmsby pushed for any advantage and set up a beautiful move up the inside into MG, only to find a box full of neutrals, both of them pushed wide and losing rythm. It was Drmsby to recover first, snatching a gear and the lead while the highly strung 500 struggled out of turn 10. But with all the hard work done and the race in the bag, Drmsby once again struck a neutral leading into Turn11, losing drive at the critical moment, Johnson slicing through and going on to win by a comparatively comfortable 0.6sec. Although the win had gone begging, the team were elated, having shown a clean pair of heels to the established Unlimited runners, and taken the battle right up to an International rider on a super-exotic bike. We also took some pleasure in posting the fastest lap, just 0.002 faster than Johnson! In terms of our class, we had the win, with Oughtred second and Wallace collecting third position after the demise of Cook through mechanical failure and Wolfenden taking an exciting run across the grass at Lukey on the last lap after getting tangled up in a racing incident with Oughtred and Hindle. Unfortunately the schedule had run a little late and our Saturday afternoon race had to be rescheduled to Sunday morning, and all races that day had to be shortened by 1 lap to suit. This hurt us as it offered less time to recover from any disadvantage we faced getting the bike off the line. We were the second race of the morning, and as competition engines can not be started before 9am, we’d had only a short warm-up before the race was ready to run. We had a brief moment of excitement as the still slightly cool bike stalled just as it was handed over to Drmsby. Some very quick work got it back to the rear of the pit, onto the rollers, started, out the front again and handed over just in time for Drmsby to roar out of the pit on the rev limiter and make the start just before the pit exit was closed - phew! After the promise of Race1, the second race turned into a bit of a fizzer. After a similar start to Race1, Drmsby was slotted into third position behind Johnson and Wolfenden when he missed a gear, letting Dean Oughtred through out of Siberia. Just a couple of corners later, Oughtred’s bike started trailing smoke and oil, covering Drmsby and the track in oil for nearly a full lap before pulling off at Honda corner. Having lost several seconds behind the ailing bike of Oughtred and with a visor almost completely obscured by oil, Drmsby had little choice but to cruise around and pick up third position behind Johnson and Wolfenden, and only 3 seconds in front of a hard-charging Wallace. With the excitement going on before the pit exit, we’d not had a chance to turn on the GoPro, so unfortunately there is no video footage of that race. Oughtred’s demise meant that all of our closest Unlimited class runners had at least one non-finish, and with the meeting recently switching to a points system rewarding finishing every race (1st 25pts, 2nd 22pts, 3rd 20pts, etc), Robert Wallace was now our closest competition for the overall win. Nonetheless, after coming so close in Race 1, and the disappointment of Race2, Drmsby was all fired up to put one over the Paton, get out into clear air, and crack into the 1:48’s. In readiness for the two final races we had opted to fit fresh tyres, and with no opportunity to scrub them in on the racetrack we had hand scrubbed them in the pits as best we could. We’d not had a problem with brand new tyres before, but also had not had to go absolutely ten-tenths on them so early before. Before the start there was high drama, as Johnson on the Paton was too late getting out of his pit and was prevented from entering the track. A harsh move on behalf of the pit co-ordinator, as no doubt Johnson was having the same problem as Drmsby, leaving as late as possible and still having to wait minutes on the grid while the dawdling backmarkers take forever to reach their allocated slot, stall their bike, go into the wrong grid position etc. In any case, Johnson would start from pit lane after the field had passed by. In addition to this, Dean Oughtred had not been able to change to his spare engine fast enough and was generously offered Rex’s bike, who was already out of contention and also distracted by his organisational role in the event. On the one hand, Rex’s bike was a serious rocket ship in a straight line, but Dean was not familiar with it and was also somewhat shy of pushing too hard and crashing the machine owned by the Godfather of Australian honda racing! Drmsby launched from Pole and was swamped by the normal Hondas - Oughtred leading Cook and Wallace, with Drmsby in hot pursuit. Sweeping past the latter two in Turn1 and running around the outside of Oughtred - who he still thought was Rex - in Southern Loop, Drmsby was headed for the lead. The graphic horsepower difference was highlighted as Oughtred shot back past on the exit of the loop, but by the time they set up for honda corner Drmsby had taken what normally turned out to be an unassailable lead. Not today however, as just as he was at full lean and picking up the throttle exiting the corner, the green front tyre let go and down he went, the bike stalling and the race over. Oughted went on to take the victory, followed by Cook and Johnson who remarkably rode through the field to third place, only 6 seconds adrift of the winner and only 0.3sec short of taking 2nd place outright. In 4th place outright and third in Unlimited was once again Robert Wallace, who took a very comfortable lead in the points tally after Drmsby’s demise. The bike was returned to the pits, the minor lever and footpeg damage rectified in short order, and we were ready to grid up for the final race of the meeting. In terms of points we were tied with Dean Oughtred on 47, each having scored a class win, a second and a DNF. Wallace was ahead on 60 pts and if he rode as before and did not have any mechanical problems would win the event comfortably. Drmsby was anxious to make amends for his indiscretion in race 3, the best way of course would be to finish the event with an outright win by showing up Johnson and the Paton. It was not to be though, Johnson setting a hot pace which Drmsby could not quite match, while Oughtred was on a mission, the two of them setting into a race long dogfight for 2nd, and hence the overall 2nd place in the meeting. Both bikes were down on power, Oughtred using his spare engine and our trusty old faithful 10-year-old engine finally showing its age. In the end Drmsby made a perfect exit to Siberia, slicing past on the outside into Hayshed while Oughtred’s machine slowed. And so the race and the meeting ended with another 2nd place outright and a win in the class, with Oughtred second and the ever-consistent Wallace third in class, giving him a very well deserved overall victory. Later at the awards ceremony he very humbly acknowledged that he was more of a support act in this event, but emphasised words spoken to him by the dearly departed Ken Wootton - “to finish first, first you must finish”. Meanwhile, Drmsby's effort in gaining the upper hand over Oughtred in the final race confirmed our overall second place for the event, which under the circumstances was an outstanding effort. And so, as does tend to happen in racing, the meeting just slipped through our fingers. Things do not always go to plan, and even when you have the pace and make no mistakes at all you can still come away empty handed. In spite of being hobbled by oil in the second race we were still in a strong position, but showed our relative inexperience among the company we were keeping by going out on green tyres and pushing that bit too hard too early in race 3, and the meeting was lost right there. Nonetheless we came away with an essentially undamaged rider and bike, having started from scratch and challenged for wins in a field of more powerful and more experienced opposition. So all in all a resounding success, we stepped it up another notch at the Island Classic 2013 and firmly intend to return next year with a few more horses and a few less neutrals.